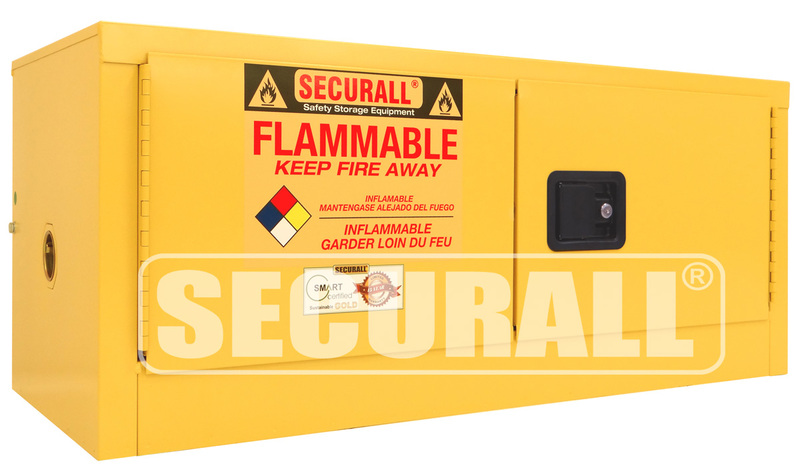 Designed to meet safety requirements whenever a job involves the handling of flammable or combustible liquids. Wall Mountable/Stackable cabinets are convenient where space is limited. Maximum storage in a compact size. 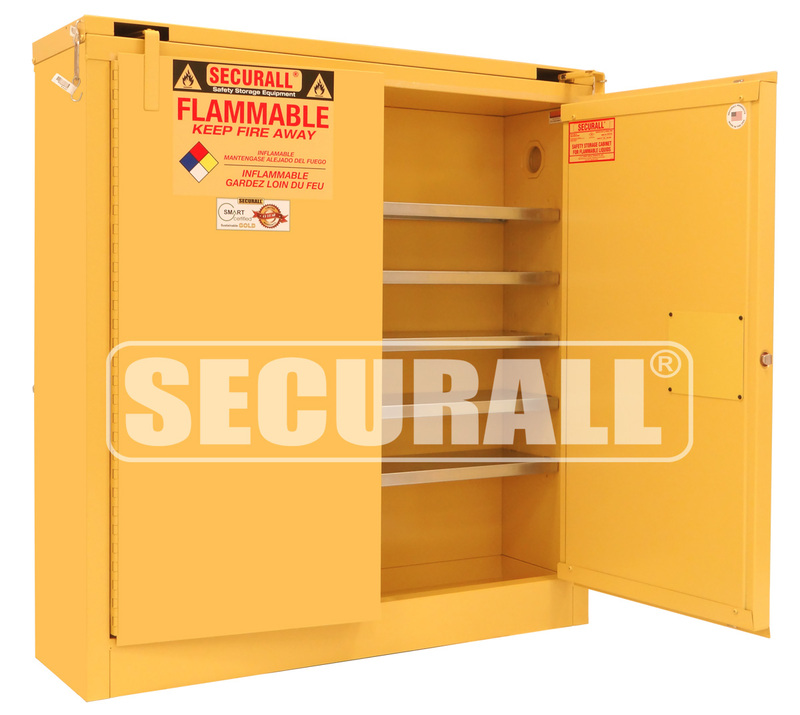 These cabinets will hold up to 24 gallons of flammable liquids without taking up valuable floor space. Furnished with brackets for easy wall mounting or can be placed on a bench top. Equipped with adjustable shelves which can be positioned to meet your specific needs. 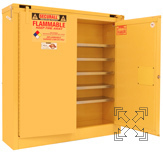 All cabinets comply with current OSHA regulations and are designed in accordance with the standards of NFPA Code 30. All models are FM approved. These cabinets are designed to be used as a single cabinet, to fit on top of standard 30 gallon cabinets or on top of each other. 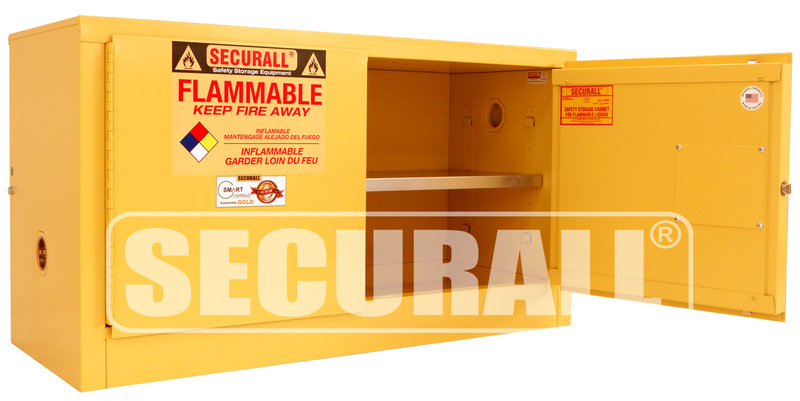 Ideal for segregating flammables or to increase the capacity of your current cabinet. WMA112 - Self-Latch Standard 2-Door; Shelves 1; Dimension 18"H x 43"W x 18"D; Approx. Ship. Wt. 163 Lbs. WMA312 - Self-Close, Self-Latch Safe-T-Door; Shelves 1; Dimension 20"H x 43"W x 18"D; Approx. Ship. Wt. 183 Lbs. WMA118 - Self-Latch Standard 2-Door; Shelves 1; Dimension 24"H x 43"W x 18"D; Approx. Ship. Wt. 190 Lbs. WMA318 - Self-Close, Self-Latch Safe-T-Door; Shelves 1; Dimension 26"H x 43"W x 18"D; Approx. Ship. Wt. 210 Lbs. WMA124 - Self-Latch Standard 2-Door; Shelves 5; Dimension 44"H x 43"W x 12"D; Approx. Ship. Wt. 227 Lbs. WMA324 - Self-Close, Self-Latch Safe-T-Door; Shelves 5; Dimension 46"H x 43"W x 12"D Inch; Approx. Ship. Wt. 235 Lbs.